The Quinnipiac acrobatics and tumbling team defeated the Golden Knights of Gannon University Sunday, April 8, 278.015 to 276.335. The Bobcats and Golden Knights were neck-and-neck throughout the entire meet. After the compulsory event, only five-one-hundredths of a point separated the two teams. Gannon had the upper hand after the acro event and took the lead 68.35-67.55. The Bobcats went into the half trailing 97.85-97.20. The Bobcats regained the lead coming right out of the half after the toss event, but the Golden Knights stayed close behind. Since neither team started to pull away from their opponent, the Bobcats and Golden Knights knew that even just a little mistake could end up being the difference between a win and a loss. During the tumbling event in the fourth heat, junior base Jenna Capristo transitioned from a back handspring to a front handspring. While in the middle of this transition, she did not get her left hand down in time. As a result, Capristo landed awkwardly on the top of her head. Thankfully, Capristo got up immediately. 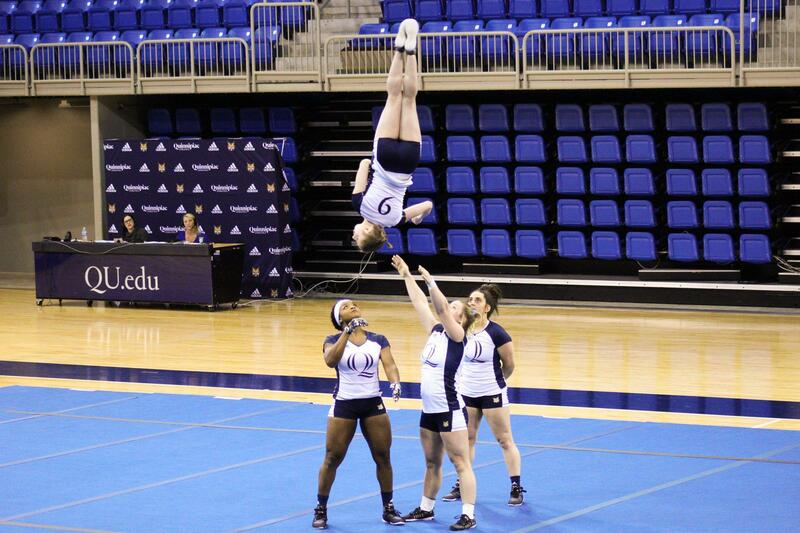 Because she didn’t finish her routine, the Bobcats knew that points would be deducted from her overall score. Despite Capristo’s slip up, the Bobcats still managed to hold on to the lead, but only by a little over two-tenths of a point. Both teams did well in the team event, but the Bobcats emerged victorious as they won the event 97.69-96.21. Overall, the Bobcats defeated the Golden Knights by a score of 278.015-276.335 and will remain the third seed going into the postseason. “What this [meet] says to me is that these kids are fighters which is good to know going into nationals,” Powers said. With it being the final meet of the regular season, the Bobcats honored all six seniors (Abby Ziser, Alyssa O’Connor, Samantha Gormley, Jenna Adams, Grace Manthey, Stephanie Van Albert) who will be moving on to the next chapter of their lives once the playoffs are over. Whenever a college athlete plays for the last time on their home turf, every player reacts differently. “For me personally I didn’t feel any different until we were walking out for the team routine and I felt like I got a lump in my throat and I was like ‘Oh my gosh, pull it together,’” senior top Alyssa O’Connor said. For senior base Samantha Gormley, it didn’t hit her until after the team routine. It might be the last home meet for the senior class, but the team still has unfinished business as it prepares to head Erie, Pennsylvania to participate in the National Collegiate Acrobatics and Tumbling Association Nationals. The NCATA Quarter-finals will begin Friday, April 27. The time and opponent has yet to be determined.